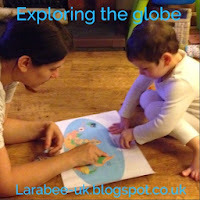 Just another super simple activity for our Around the world month today, the point of this subject is to gently introduce T to where he lives in relation to the world, the bigger picture if you like! This is a theme that we will go back to many times, I'm sure as there's so much to learn but for now it's all about awareness, I've always been keen to explore other cultures and celebrations as a family and this introduction will fit in nicely as we start to include T.
T and I talked about different countries, he's now able to point out the UK on the map, I want to introduce the globe this weekend and see if he can still identify it! We talked about the places he's heard of in the Octonauts(!) Australia, Antartica, the Amazon and some places his Daddy and I have visited. Because we used the World Cup flags we didn't really have ones for our discussions, and Europe is too small for these flags, but we managed to have a good chat about it nevertheless. 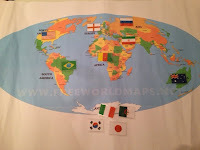 We then laid some of the flags onto the relevant country. 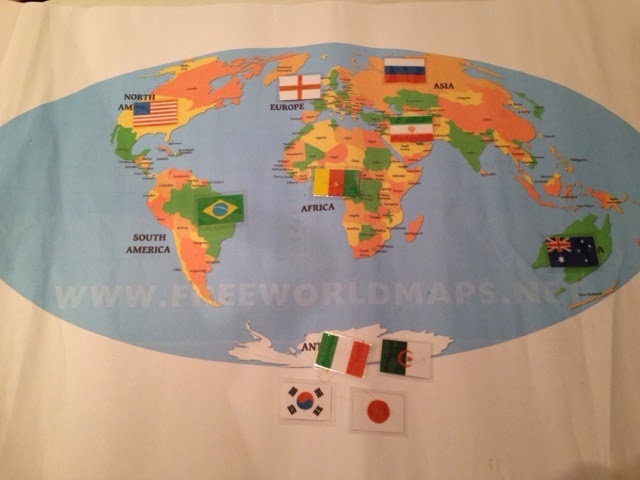 I'm going to extend this activity by printing off a new map and putting it on a pinboard in his room, I'll then make some flags and as we celebrate or learn about the new country will pop in a flag! I'm hoping that might make it a bit more relevant for him, rather than just staring at an atlas! This month we are learning all about other countries around the world, how they affect us, how we interact with them and just general awareness of other cultures. You can follow all of our posts on twitter and instagram using #booboxaroundtheworld and our 'Kids stuff - around the world' pinterest board contains lots of ideas from other people. If you have a post or activity you'd like us to feature, email me or comment and I'll be in touch, we'd particularly love to have some features from other cultures.